Let’s talk about “releasing” the putter head. It’s discussed a lot among golf instructors, letting that head “pass” the hands as it goes through the impact zone, but is that what you really want to do? Putt like Jack Nicklaus, that’s what. 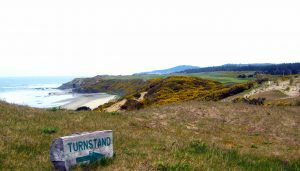 Nicklaus, perhaps the greatest golfer, and putter, of all time, looked at and practiced putting in a much different way, one that should be emulated far more than it is among amateur golfers. In that familiar stance of his, hunched over with his dominant eye DIRECTLY over the ball so he could see his line without any distortion, his feet slightly open but shoulders square to the line, he was going for what he thought of a “battering ram” or “piston” stroke with very little or no opening the face in the backstroke or closing it after impact. 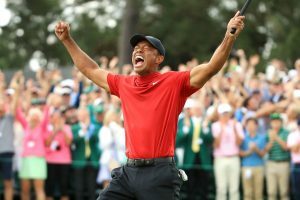 No breaking of the wrists, certainly, but really, he didn’t want the putter head passing the hands, either — or at least feeling like they were passing the hands, though in reality they were, just a bit — unless it was a very long putt with more of a follow-through. He wanted to keep that face square to the target line as long as possible by keeping his hands moving forward, toward the target. Makes sense, right? 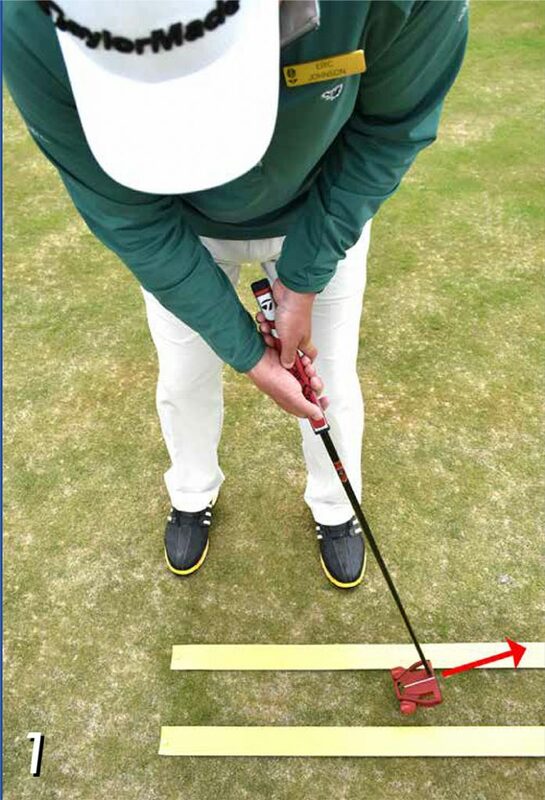 One thing that helped jack keep that face square is getting the putter shaft closer to “vertical” by lifting his hands away from the body ­— a technique you can also see in some of today’s best putters, including Steve Stricker. When Chris DiMarco was at his best a few years back, he did that, too. It all comes down to this fact: Where that putter face is coming into impact is way more important than the “path” of the club — that slight opening and closing that a lot of teachers describe as “release.” Even if you have the “yips” or your hands are shaking due to nerves — which happened to me when I played in the Canadian Open years ago — you can still make putts by keeping the face on line. 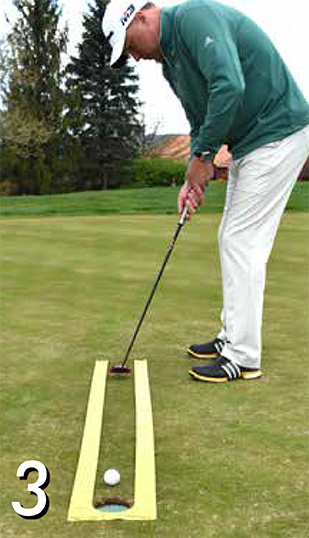 In the following photos, I’ll show how I incorporate Jack’s method into my practice by stroking five-foot putts through one of several handy training aids I use during my lessons with Nemacolin guests. Work on this technique, push all thoughts of “release” out of your mind and watch your score drop. 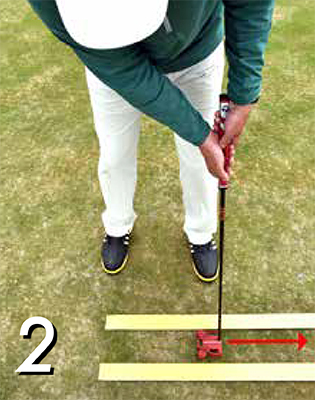 Photo 1 shows how stopping the hands at impact and letting the putter head release too much affects that face. You can see by the arrow that after impact, the face is aiming well l eft of my target. Only a few putters in history, like Arnold Palmer or Isao Aoki (remember him? ), could get away with this method. 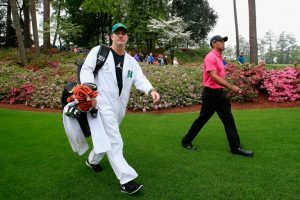 Keep the hands moving — that’s where the “rocking shoulders” you see in the pros comes from, not from actually moving the shoulders themselves. Photo 2 shows what I’m talking about. The goal is to keep the forward arm and putter shaft pretty much in one straight line through the putt, with the arm following the hands forward and toward the target. Look where the arrow aims now — right at the hole! Photo 3 illustrates the “high hands” look I’ve mentioned — the shaft is a bit more vertical, with my hands away from my body to maintain that piston action of “pushing” the ball down the line and toward the hole. Photos 4-6 bring everything together into the piston motion you want. Though I’m not hunched over with Jack’s open stance, I’m keeping my left forearm, hands and shaft in a solid line through the entire putt. Sure, the face opens a bit going back, but at impact and afterward, it stays square to the hole, resulting in a made putt. Remember, instead of worrying about releasing the hands, keep them moving forward like a piston, and strive to keep that face square to the target for as long as possible. It worked for Jack and it’ll work for you.